Corin Cadence has never been quite enough for his family. Or at least, he's never been quite good enough to make his father happy. Or to keep his parents together after his brother's disappearance. When he finally reaches the age to go through his judgment and learn what kind of magic he'll get, he even manages to bungle that. He comes out with the least powerful attunement possible. He is an enchanter. His father, focused as ever on Corin's failure, compounds the humiliation by introducing him to the half-sister he thought was going to be his most loyal servant -- and who is now his rival for the position of heir to House Cadence. Together, the two embark on an educational journey that will test their friendship, and their devotion to their family, as deeply as it tests their abilities. 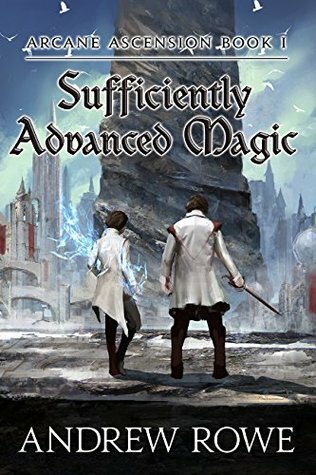 With a cast of endearingly earnest and sarcastic characters, Sufficiently Advanced Magic is a fun read. It's High Fantasy - for the beach. In this first book of his Arcane Ascension series, Rowe has created a rich, sprawling world. He leverages the language of popular role-playing games, weaving it into his story and making it his own. And through it all run the kids - a small group of young adults who recognize their shortcomings and push on anyways. I look forward to following their journey in the coming books.